Everyday household use can cause a variety of discolorations on your granite, marble, or other natural stone surfaces. This product list has been put together to help you quickly find a solution for the stain you have. Need to remove a rust stain from granite? What about water marks form marble? You will find stain removers here for virtually all stone surfaces. Clean your quartz surfaces with this Cleaner designed to remove water spots from quartz countertops and clean dirt, or lime deposits from quartz material. Colored stains on quartz surfaces are often times a bit more stubborn than the average everyday spills and messes. 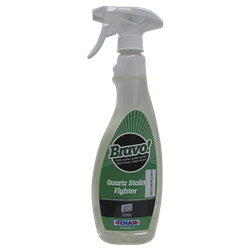 This stain removing spray is designed to lift these stains from quartz. Rust removing liquid can be used by itself or used with poultice powder for a deeper acting rust remover.